Breakfast, Lunch or Dinner daily on buffet / fixed menu basis. Pick-up & drop from / to railway station / airport on arrival & departure. Breakfast, Lunch OR Dinner on buffet / fixed menu basis. Children below 6 years accommodated FREE in parent's room. One session of Steam & Sauna bath once during stay. Ayurvedic massage (Foot or Face or Back or Head) for 2 person once during stay. 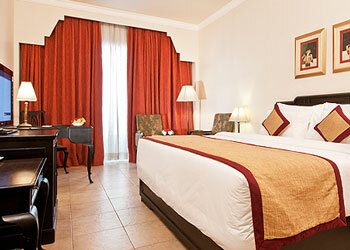 Howard Plaza-Agra offers 83 first class rooms & suites. 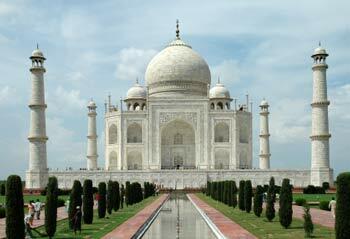 The rooftop-viewing gallery allows guests to enjoy the surrounding sights, including the Taj Mahal. Only 4 km from Railway-Station and with an easy access to the air-port, this hotel is located only 1.5 km from the most famous tourist attraction in India : Taj Mahal. All rooms are equipped with CCTV, minibars and direct-dialing facilities. Room service is available 24-hrs a day. This hotel has coffee-shops, a health club, a well-maintained swimming-pool, mini-bars in all rooms, 24-hrs room service and many more. Distance from railway station: 4 km.